I have a confession to make. Bowie has not slept through the night in about 2 months. And it’s not teething, and it’s not hunger, and it’s not noise (well, not all the time, because, well, THREE PETS). We’ve tried to remedy all those problems, and it still seems to be happening. At first, we gave him more milk, and he drifted back to sleep. Then, that didn’t always work. He was cutting molars at that point, so we’d give him Tylenol and rock him back to sleep. Then that stopped working. So, then we were rocking him, laying him back down then rubbing his tummy or head until he fell back asleep, and then slooooowly tip toeing out the door, careful to step over the creaky board. On a desperate night, we’d bring him into bed with us. I say desperate because, a toddler moves in their sleep the way they do awake: NON STOP. Kiddo might sleep, but you won’t. Plus, we’ve been mighty turned off of co-sleeping having heard one horror story after another about the six year old that refuses to sleep in their own bed. No thanks. But, sometimes when you’re holding a screaming toddler at 3 in the morning, you don’t do the most rational thing, just what seems the easiest in the short run. And, to top it all off, I get these developmental emails each month telling me what’s normal, what we should watch for, what kiddo should be able to do, etc. And it says this is all normal. NORMAL. And it can last for a whole year. YEAR. I think it’s payback for all the times I bragged that Bowie slept through the night at 3 months. On Tuesday, Bowie had a pediatrician appointment at which he received three vaccinations. The DTP shot proceeded to make his entire left thigh hard, red, hot and throbby. Also, rashes all over his neck and back. Plus, it took the doctor forever to return my frantic calls, so I was browsing the intertubes to find some info and yes, you guessed it, freaked me the F out. Stupid internet. Later that same evening, we had a BBQ with the neighbors. Bowie walked up to the grill and touched like he has a zillion times, only this time? HOT HOT HOT DANGER DANGER and everything was in slow motion, I just could not get to him in time to prevent it. He got two very large blisters, and most of his fingers on that hand are burned. One of the blisters has popped and it looks NASTY. I think I have to call the doc again, ugh. My mother-in-law is in town and borrowed our car to get to and from my sister-in-law’s house. Which would be fine if all the computer systems in all the Matrixes weren’t randomly shutting down rendering the car useless, and ours decided to do so when she needed the car. Thankfully she was not on the highway or anything, and I guess it’s also good it wasn’t me and kiddo going somewhere on our lonesome. That could have been scary. Last night, Bowie didn’t sleep at all. Well, that’s a slight exaggeration. He slept from 8 to 10pm, 11:30 to 12:30 and then maybe for an hour between 2 and 6am. I had been out with friends until 12am and was really looking forward to my date with my soft, comfy bed. Little did I know a tossing, turning, teething, burned finger, vax reaction, crabby toddler would be joining me. I’m running on about 2 hours of sleep today. As is my husband. Also, my husband has been undergoing a barrage of medical tests and procedures in order to find the cause of the mysterious loss of his sense of smell. We have insurance, so we didn’t think it would be a big deal, but we got the bill for the CT scan yesterday and…holy Jesus. Guess I don’t get to see the Cubs when their in San Francisco this year. And that Wisconsin wedding in January? Sorry Jess, love you to death, but we’re drowning in medical bills. Even though we have insurance. Oh, but the system is just fine as is. Grrrrrrrr. Anyway, hopefully you had a better week than me. Two years ago, we were just starting to try to conceive. I was poring over websites dedicated to tracking your ovulation. And I’d pass on all the (gory) details to my husband. I purchased my first pregnancy book, The Mayo Clinic Guide to a Healthy Pregnancy. I immediately flipped to the back, to the “Labor and Delivery” section, praying to God there was a section entitled, “It Won’t Hurt That Bad”. There wasn’t. I remember seeing those Johnson & Johnson commercials before I had a kid, the ones that say “A baby changes everything”. I thought, well they don’t have to change every single thing. That’s crazy. But, they do. As corny as it sounds, they really do. There is no part of my life left untouched my by little man. And I truly have a hard time remember what life was like before him. What it was like to decide at 9pm that you were going to go out for beers with friends at 9:30. What it was like to pop out the door for five minutes to go grab something at the grocery store. What it was like to sleep from 10pm to 10am. What it was like before I had this new piece of my soul that I am now convinced I could not live without. Happy, happy birthday my sweet boy. Here’s to many more. Um, yes I can. Because I do. But I just sit there with a sheepish grin on my face. I mean, if I was doing it just so I could say I was doing it, it wouldn’t have lasted this long. I don’t do it because I was told to by some parenting “expert”. The idea actually came to me mid-pregnancy. I was thinking of how much money we were going to save by breastfeeding, and I wondered if the same savings could be achieved with food. Eureka! I’ll make my own! It can’t be that hard. Took me about 10 seconds on Amazon to find a few good sources, and the rest is history. The point is moms do A LOT. If they got paid for it, it would be the highest paying job ever, and everyone would want to be a mom. And not only that, but making baby food doesn’t take anywhere near the “all day” time frame most people think. An hour, tops, on a Saturday afternoon, and we’re set for 7 to 10 days. So, yeah, let’s put a dollar value on your time, and then we’ll give you what you’re owed for an hour. And I’m betting it’s still cheaper than paying $0.85 a jar for 10 days worth of food. That was a bit of a tangent, sorry. Like I was saying, the first reason I do it is monetary, but the second reason is that my in-laws are major foodies. And they’ve turned me into a bit of a foodie too. And I want my son to be as adventurous with food as a kid can be. I know there will be those years where he’ll eat only PB&J or mac & cheese, but I hope I’m instilling a love of adventurous eating [knock on wood]. So there you have it folks. You can say I’m a snob. You can say I’m idealistic. You can say I’ve got too much time on my hands and just wait until #2 comes along. I don’t care. I like making baby food, my baby likes eating it, simple as that. Next time you want to say something about it though, try to remember the mom sitting next to you just might make her own baby food. I have to come clean. Previously I have been the outspoken sort when it comes to absolutely, hands down vaccinating your baby. I had heard all the media babble about the MMR being linked to autism. And then that it was not related at all, which decided it for me. I was going to get ‘em all. Why not? 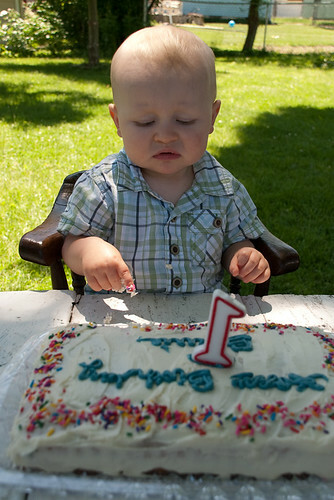 But, turns out before your baby’s first birthday, you don’t really have to think about it very much. I mean, they get vaccines, but those are basic vaccines that all babies should get. And just a few. You don’t have to think about many of them, and when they’ll get them and how many at once, etc. until the 12 month check up. So, here I sit with that 12 month appointment looming, and three times in two days, random moms at the playground and café have asked me, “what are you doing about vaccines?” I took it as a sign that I was slightly uninformed and really ought to get informed before D Day (V Day?) arrives. All it took was one 10 second Yahoo search for me to realize I was in trouble. All that shooting off at the mouth that I had done, and it turns out I don’t want to give my son the MMR until 24 months, and I don’t want to give him the Varicella vaccine at all. There’s WAY more to this than just autism. Ooops. So, this post is two-fold. For starters, I want to apologize for any parent that I have offended on other sites with my very vocal campaign to vaccinate your kid against every known ailment, no matter what. Clearly I was misguided. And secondly, I want to reach out to the parenting community out there on the intertubes: What did you do? Why did you do it? What is your advice for me? For the past few weeks, whenever I mention to someone that I work at home, their immediate response is, “oh, so you have a nanny come and watch Bowie?” And when I say no, things are working out for us at the moment, I get only one look—perplexed. Honestly, I’m just very lucky. The type of work I do is such that I can pick it up and put it back down a hundred times an hour if I need to. And I don’t have to keep certain hours. When he’s napping I have a good chunk of time during which I am able to get quite a bit of work done. And then again at night for an hour or so before going to bed. The point is, it gets done. And it gets done well. If I had a big, high-powered, fast-paced kind of job, I’d get a nanny in a second. But I don’t have that type of job and don’t need help. I know people mean well, and I appreciate the concern and the advice. But none of them knows of the exact nature of my work, of my working style, of my son’s daily routine or typical behaviors, of my income and whether it’s worth paying for the help or not. What worked for them is not necessarily what will work for us. Heck, what works for a ton of people in this world, in this day and age, still is not necessarily what will work for us. I enjoy the way things are working right now. I look at my hourly breaks from the work as a bonus, not a pitfall. I’m happy when I’m with him, which I’d like to think improves my job performance. I have had some busy days where I know I won’t get everything done that I want to. Once in a while something’s got to give, but I’d rather it to be the laundry or the trip to the store. I’m not above asking for help–when I need it.